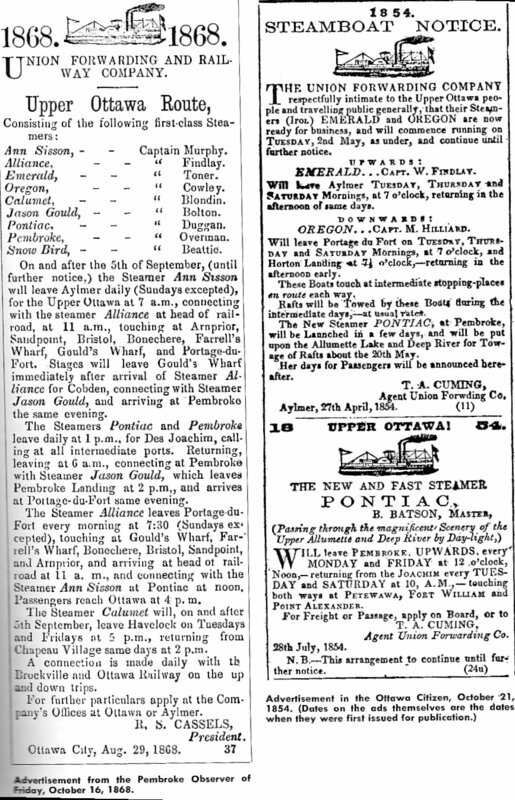 Announcement of the maiden voyage of the Steam Boat "Union"
Another early steam boat on the Ottawa River and the Rideau River, the Shannon at Entrance Bay in 1836. 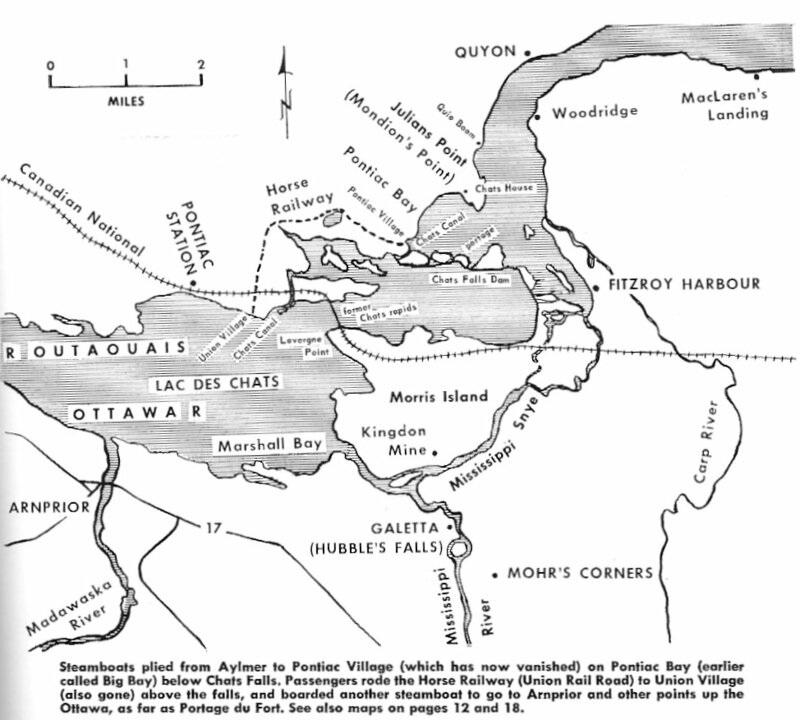 Photo Source: Ottawa Old and New, by Lucien Brault, PhD., 1946, Ottawa Historical Information Institute, page 97.
brought thousands of typhus victims from Montreal to Ottawa. Some assisted passengers who travelled upriver to various destinations in 1845. Fitzroy Harbour. Passengers disembarked on either side of the river on the way. Pat Ryan 2      W or M Phee / Fee? Quebec) to the Chats Falls at Fitzroy Harbour. the Chats Falls. A hydro-electric dam was built here in the 1930's. 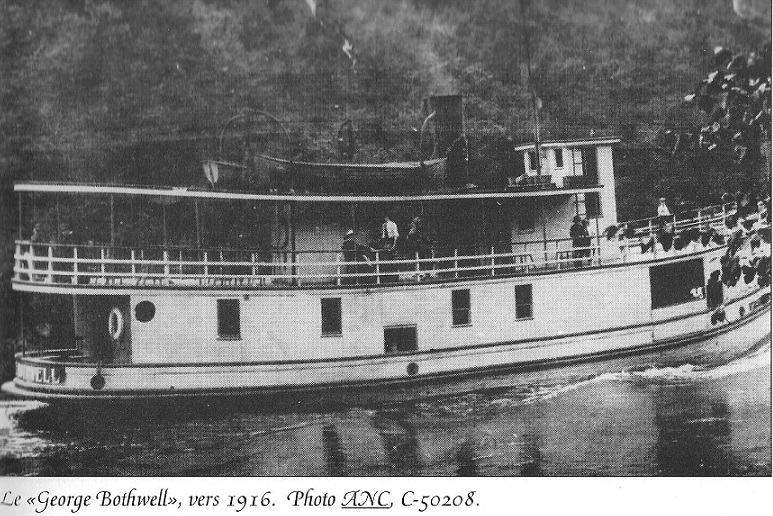 Thought I'd provide you with some actual accounts of steamers on the St.
died on board in 1913. She was Catherine (Costello) Kennedy. Please enjoy. This information is out of those $5.00 books I bought at a flea market. allowed to approach the table till the stewards in a loud voice announced, "
knew us, and after a little delay we had a separate breakfast served to us. It was the custom in those days to sneer at the Yankees. In 1876, John J.
pleasure of travelling in company with some four hundred of these tourists. preferred bread and cheese on deck to partaking of that horrid repast. great dainty on this side of the Atlantic." Colonel By died February 01, 1836. 1840 - 1846/47. The boats he was on ran between Aylmer and the Chats Falls. riding a full week on horseback each each way. 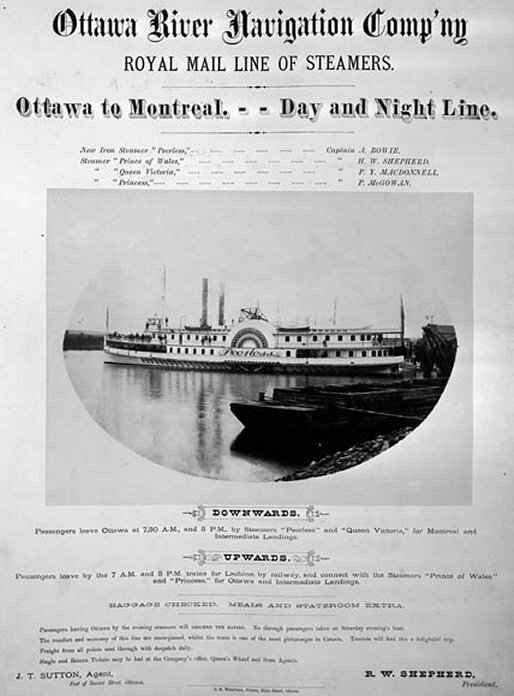 kept up until the Ottawa Forwarding Company was established. Mills Canadian Coastal and Inland Steam Vessels 1809-1830.
foot beam. The registration number was 9033818, and the Mills Number was 1597.
will be in readiness to convey the Passengers to Bytown, the same evening. Boat may be engaged for towing Rafts, or for pleasure parties, if required. given guaranteeing their being safely landed, as directed when the Companys risk ceases. Agent in AYLMER; CHAS. SYMMES Aylmer, June 3, 1836.
advertisement was in the April 16, 1840 issue. 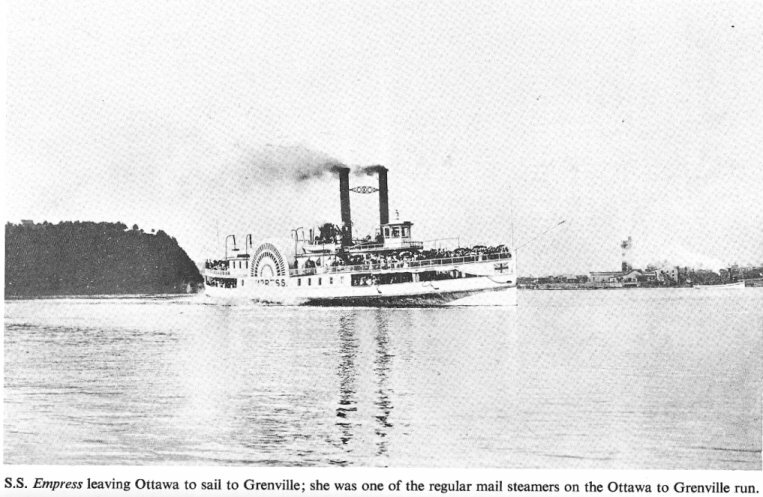 these two boats they started the fourth line of steamers plying between Montreal and Quebec. 253 of the passengers were killed in the fire or by drowning in the cold waters of the St.
1844 through the last copies of the paper found on file, dated during the summer of 1845. 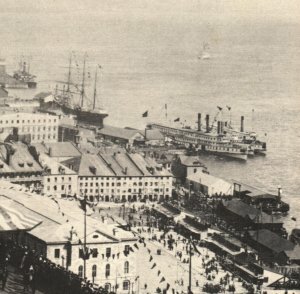 The "Rideau" - now there's a steamboat I remember. (Not that I was there). But I remember seeing the name before. > through another book I bought, published in 1955 about the Rideau Canal. Ellen D'Arcy / Darcy of Sheen. Thanks, Eileen Boardman, oldest living grandaughter of Denis and Catherine. One of the best books on this subject is Clyde Kennedy's The Upper Ottawa Valley. the Lock masters employed there. 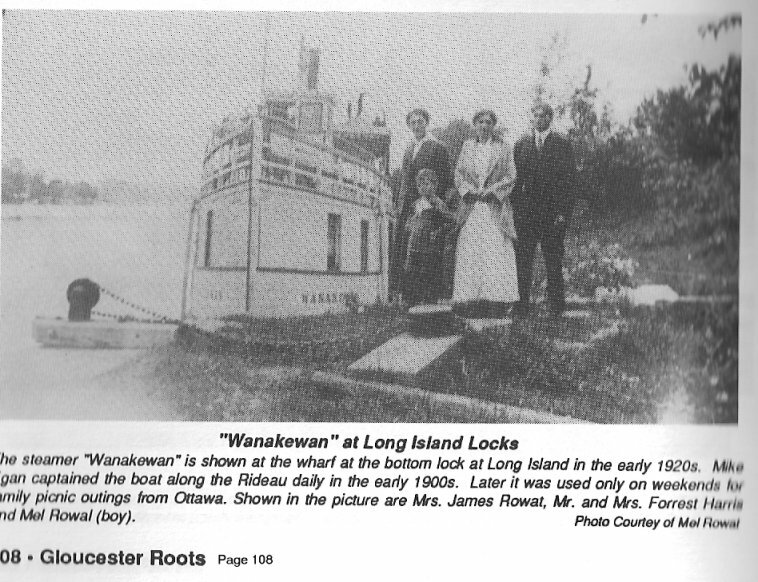 Hawkesbury -- he built steamboats for use on the Ottawa River and possibly also for the St. Lawrence River. some information, but I don't have a copy of it yet. have information regarding early activities on this part of the Ottawa River. 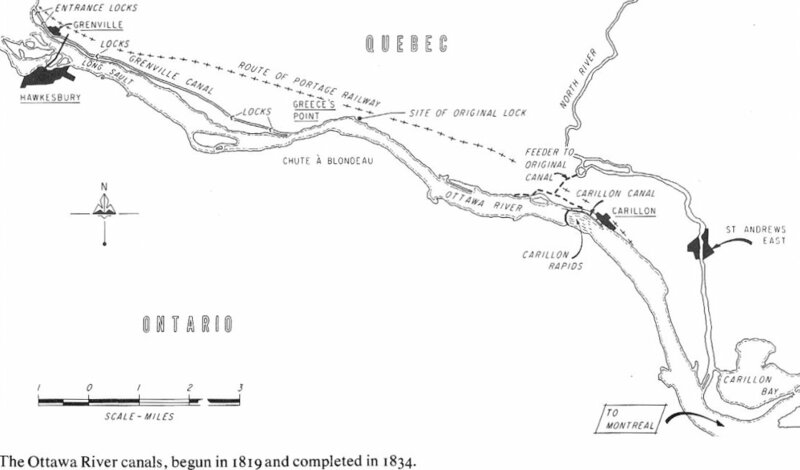 and Anne-de-Bellevue projects and their overall relationship to the "alternate route"
from Montreal to Kingston. Unfortunately he does not include much on post construction. Thomas, provides more information on the locals. century language. I would be happy to pass it on if you like. at Hawkesbury in the 1820's. A possible relation. See also an excerpt from Robert Legget's book "Rideau Waterway"
his works, was the erection of the roof on the Library of Parliament in Ottawa. All the other works I have discovered, were building related projects in Ottawa. 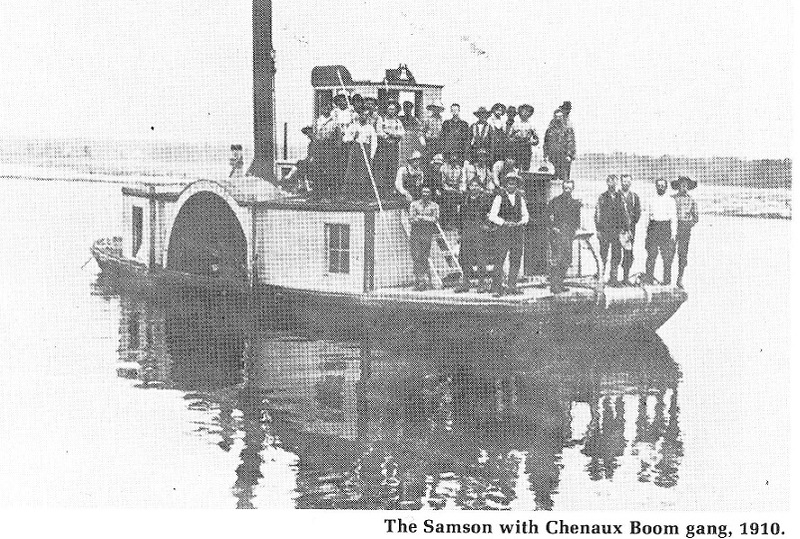 the Town" and inspiring local pride in the craftsmanship (VMC:" Champlain Trail Museum")""
Source: Steamboats and Canals on the Ottawa River - Cultural Heritage. 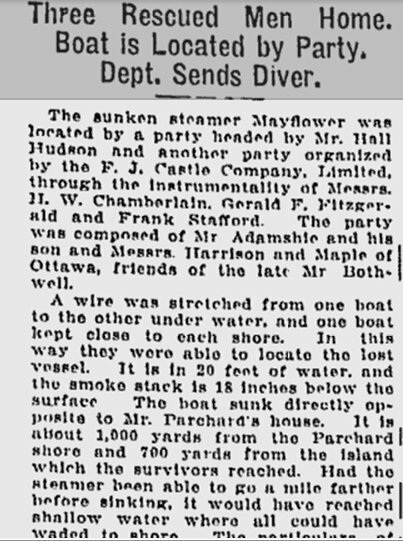 I have been unable to find any information on the steamship in any Ottawa newspaper reference. for my family tree project. have appeared in a Montreal or Lachine paper around 1875 or 1876.
tomorrow morning at ten o'clock. think he was paid 114 pounds for this survey. 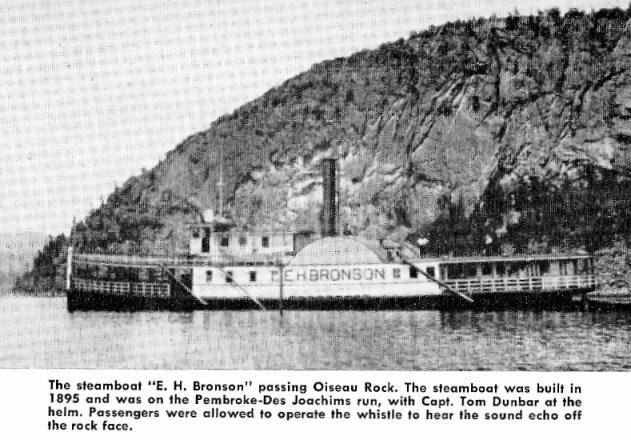 Photo Source: The Upper Ottawa Valley - A Glimpse of History, page 31.
keywords: Erskine Bronson, Oiseau Rock, Deep River, Ontario, Thomas Dunbar, Des Joachims (Da Swisha), Pembroke . 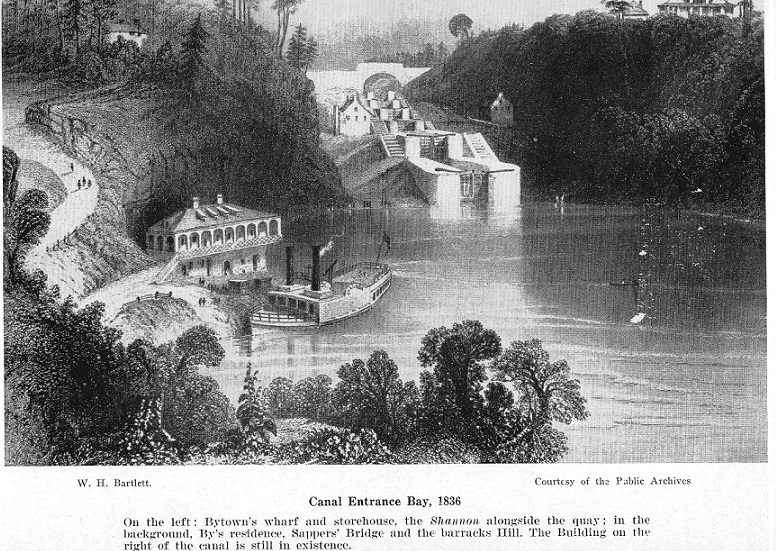 Photo Source: The Upper Ottawa Valley - A Glimpse of History, page 139. 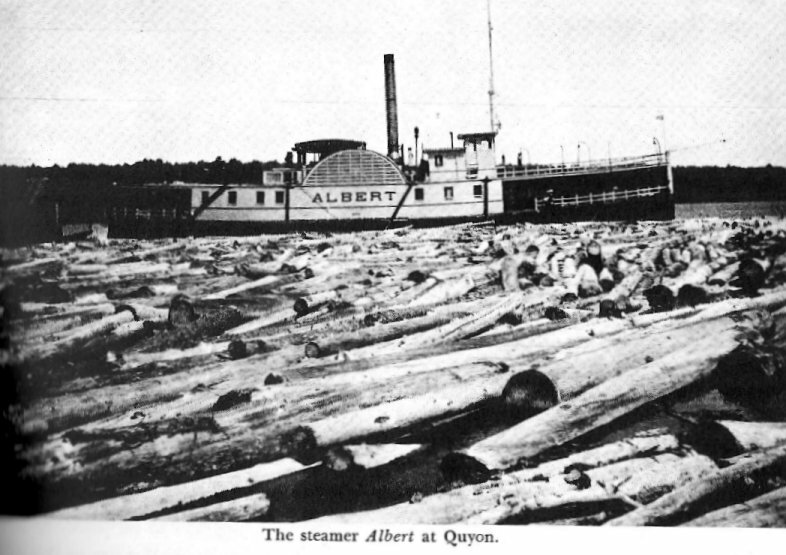 Image Source: The Upper Ottawa Valley - A Glimpse of History, page 143.
boiler of this steamboat exploded in 1842, was Mr. Thomas Cousens / Cousins. 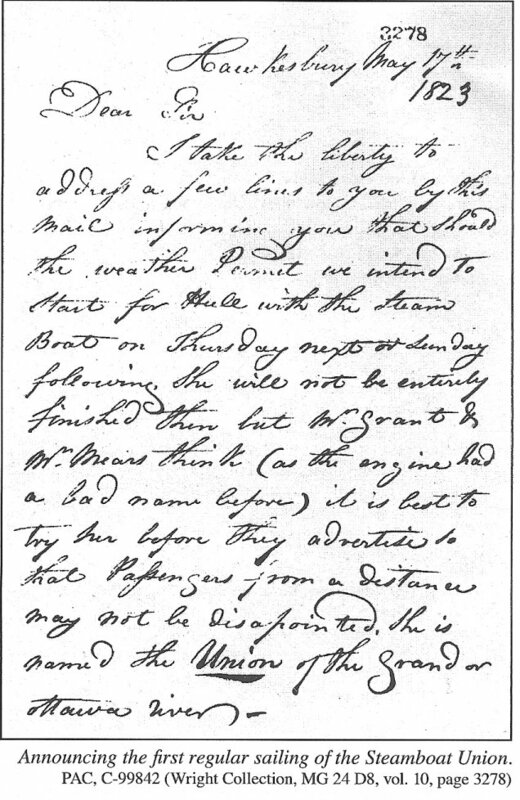 Bruce Graham is interested in early mail contracts and mail delivery by steamboat on the Ottawa and Rideau Rivers. 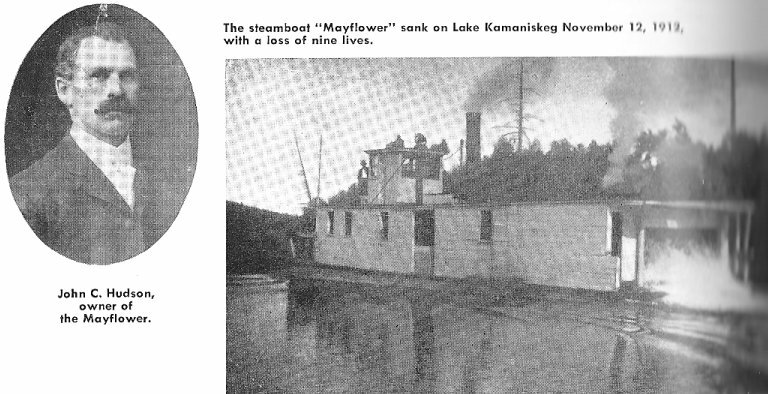 In 1912, the steamboat Mayflower, owned by John C. Hudson, sank in Lake Kamaniskeg (Aboriginal name for "Wild Goose") near Barry's Bay, Ontario. including the names of the nine persons who lost their lives. The complete article is available in the Ottawa Citizen Archives. are quite independent of the weather, and are not subject to such delays and fatigue as in coming up the St. Lawrence. think they are the finest in Canada." 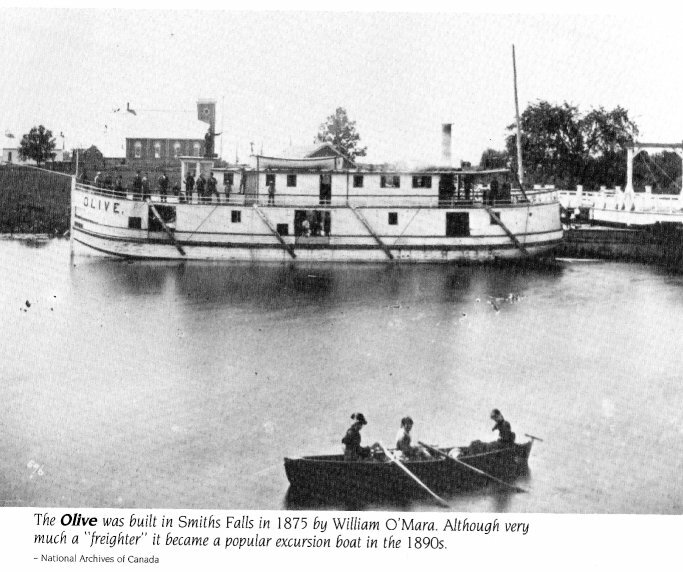 The Steamer Olive at Lindsay's Wharf, Kars, Ontario (on the Rideau River). 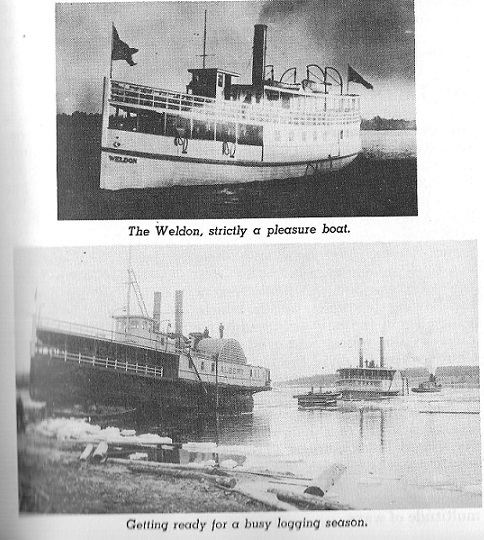 These are a couple of stories I found in the Ottawa Press regarding the paddle wheeler PEERLESS. by Mrs. J.M. 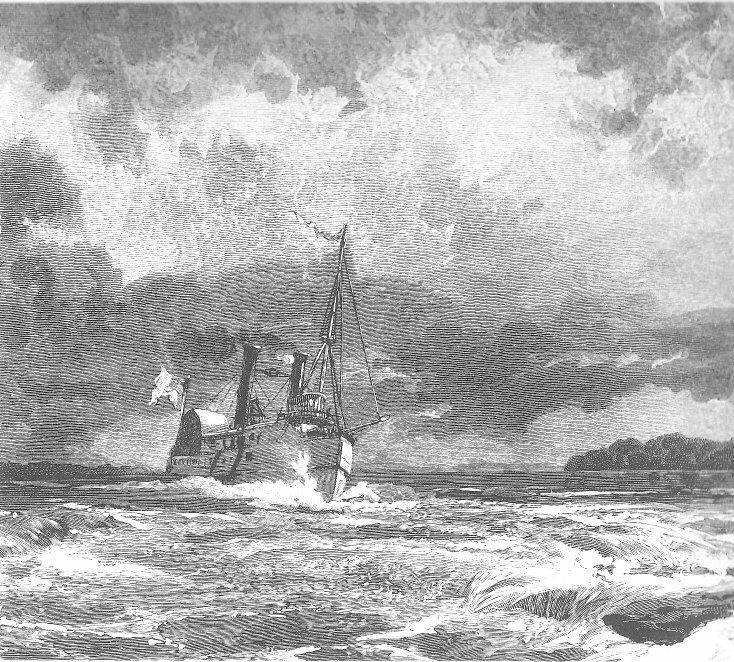 Currier, who gave the beautiful vessel her worthy name, amid cheers from the people on the cliffs. Capts. Bowie and Shepherd were present and Mr. Girard, superintended the workmen engaged in the mechanical arrangement. The Peerless measures 200ft. overall; 28ft beam, 8ft 6in. hold, and will draw, when loaded, 4ft. 6in. of water. ready to take her first plunge. expressed himself well pleased with the appearance of the new craft. and the flag of the Dominion (the Union Jack) floated from all parts of the rigging. dashed the bottle of wine into fragments upon her bow, and gave her the name Peerless. number of ladies and gentlemen partook of a Champagne lunch. 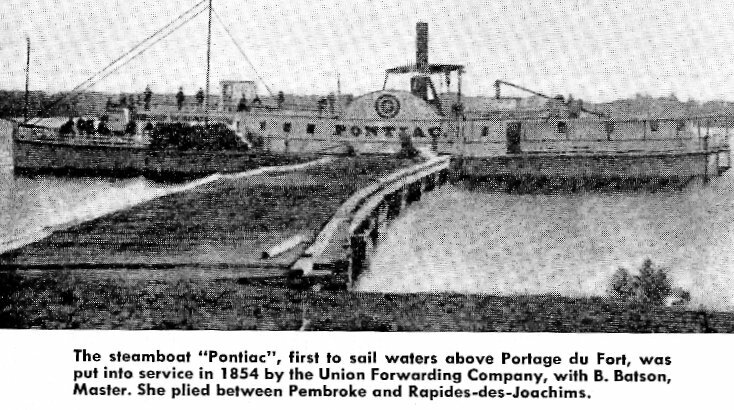 but also for the enterprise they had exhibited in aiding the progress of the Ottawa county. on the shores of the great river they navigated, who had extended to them their confidence and patronage. Mrs. Currier, who had kindly performed the ceremony of naming the vessel. Mr. Currier responded on behalf of his lady. and that of her Capt. endeavor, as in the past, to deserve the confidence of the people and the company with which he was identified. the toast to the ladies by Mr. Nathan, M.P. after which the party dispersed. country man hot on board at the former place, apparently in good health, but somewhat intoxicated. the purser shook him again and again, but no amount of shaking could wake him from his sleep of death. on the body. The jury returned a verdict of death from heart disease. new e-mail address for Bruce Graham added to the list below. 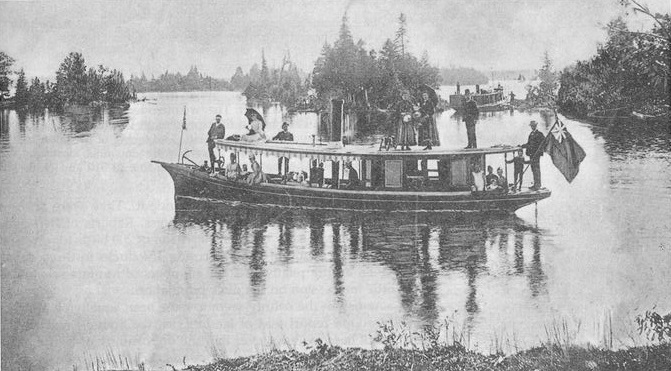 A nineteenth century "party boat"
Horton Townshipjust west of Ottawa, was well known in the 1800's as a leading employer in the Canadian forestry industry. 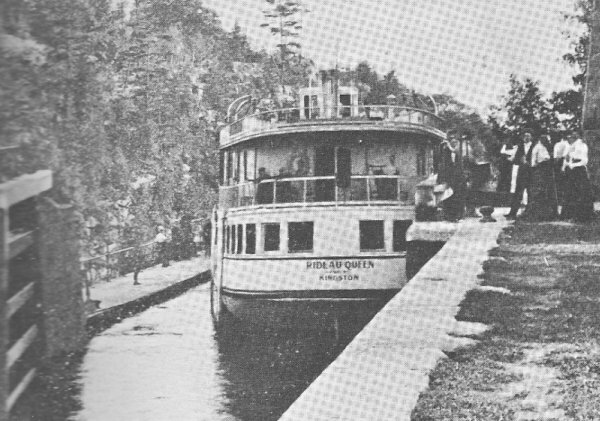 The following picture shows the steamboat Samson owned by the Upper Ottawa Improvement Company. Photo source: Horton - The Story of a Township, by Doris and Campbell Humphries, Juniper Books, 1986, page 5.